Home &gg; Blog &gg; Conferences/Community, Featured &gg; Are You Part of the Measure Slack Community? 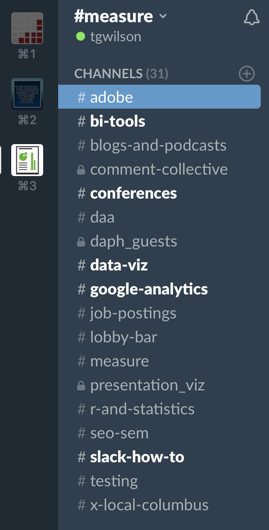 Last week was a particularly nice week for me in the Measure Slack team, and, while I tout it every time I speak and at the end of every episode of The Digital Analytics Power Hour, and it’s the first resource listed on our analysts resources page, I realized I’ve never blogged about it. Of course, as soon as I start to write something down, I find myself in the mental pursuit of multiple rabbit holes. But, I think I can keep this fairly brief. Just like the digital channel itself, back in the day (“Listen up, you young whippersnapper!”) there was only one online community that had any real meat. That was the Yahoo! Web Analytics group, originally created by Eric Peterson, and then handed over to the (now) Digital Analytics Association. I was an active participant in that group. I credit it with: my initial exposure to Eric, the creation of Columbus Web Analytics Wednesdays (I connected with the two other co-founders of the group through the forum shortly after moving to Ohio in 2007), and much of my early education about web analytics. If you actually clicked through on the link above, you likely saw a “no activity in the last 7 days.” According to this analysis, that group peaked in 2008. But, even as the Yahoo! group declined, there really was still only one online community for web analysts: Twitter emerged. Initially, the hashtag we used was #wa, but then the state of Washington started using Twitter, and the hashtag of choice shifted to #measure. That was pretty awesome, too. I’m not even going to begin to try to list all the people I initially connected with through Twitter who have gone on to become good friends, colleagues, and collaborators. I still keep my Twitter app open most days, and I get good content when I scroll through that feed…but it takes some work to separate the wheat from the chaff. Adobe Analytics Forums Fairly active and monitored by Adobe staff The interface is clunky, and the search is…not awesome. And, of course, it’s content is limited to Adobe Analytics. Google Group for Certified Partners Very active, super-knowledgeable participants Content limited to Google Analytics…and…you have to be a GACP to participate. DAA Community Topics are good and wide-ranging It’s not super-active (but there is daily activity on it…and the DAA is working to increase the activity); you have to be a member of the DAA to access it (and being a member is a good thing…but not for everyone). Various LinkedIn Groups (I’m not sure.) I know they exist, but I’m not aware of any particular ones that are super active. The Measure Slack Very active; organized into channels; very good search functionality; support for public groups (channels), private groups (which anyone can create — think “group chat”), and private messaging; overall great UX If you’re not already using Slack…it’s “another app” to have open or check in with periodically. So, yes, you have to “apply for membership,” but no one is denied, and it’s free, and only egregious misbehavior gets disciplined (gentle chiding about using the appropriate channel, not cross-posting excessively, etc. is performed through private channels). The image shown here is my sidebar. Because it’s Slack, it’s highly customizable, but, hopefully, if you’re not already in the platform, this list will give you a good sense of the diversity of the content. I pretty much live in the #r-and-statistics channel these days, and every day or two I click through the other channels that are showing unread messages. The depth and quality of the discussion can’t help but leave me with a sense of pride in our industry and the way that analysts inherently just want to solve problems — whether they’re their own or those of others — and are humble and gracious when hashing out ideas. If you’re already an active Measure Slack participant, then spread the word. If you’re not a member, then head over to http://join.measure.chat and sign up! Ok, and where is this Google Analytics for GACP group? Can’t You give url? I have GACP and AdWords certificates and want to read something new. There’s also stackoverflow.com/questions/tagged/google-analytics but I find majority of these questions to be about technical struggles. Thanks! I’ve been trying to get a more into Reddit, and tracking down the best subreddits for me is part of the challenge. Thanks for that tip!